Who is the Healthcare Consumer? Hospitals are discovering that it’s not enough to deliver excellent quality care to remain competitive. Today’s knowledgeable healthcare consumers, especially younger patients, consider brand reputation and patient care experience before their physician referral. In response, healthcare providers need to communicate the institutions competitive position and deliver the expected patient experience to connect with younger generations. This is a new expectation for healthcare marketers, but for the majority of retail brands it has always been this way. More and more, patients are shopping around for care, the same way they do for other consumer services. Patients are actively researching their clinical care alternatives to determine how and where they will spend their healthcare dollars. To attract and engage patients, agencies like Smith & Jones, help hospital marketers understand the evolution of the healthcare consumer and what elements influence each demographic group. People 65 and older make up about 12% of the US population but they also account for 355 of hospital stays and 38% of all emergency room medical care. They require more and longer patient visits and expect a very high level of service from their doctors. This generation follows their doctors’ recommendations for their care and rely on them for health information and referrals. We have to keep in mind, however, that their children, the baby boomers, may be making their healthcare decisions. 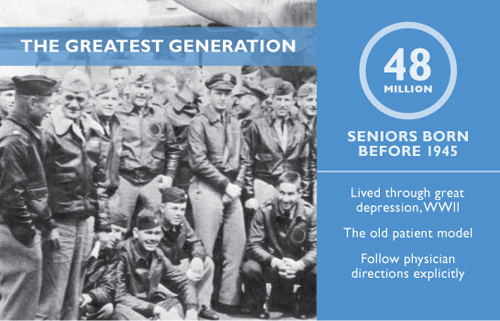 When selecting a hospital, this “greatest generation” patient is influenced by their doctor suggestions or where they have had prior care, followed by the hospital’s reputation or its proximity to their home. Baby boomers are the ‘silver tsunami’, this is a growing population of senior citizens which is changing the entire healthcare industry. They question everything and search for new healthcare solutions. Boomers are also act as caregivers for both their parents in the “greatest generation” and for their Gen-X and Gen-Y kids and grandchildren. This huge generation is influenced by their doctors, but they research their own options, they challenge proven assumptions and rely heavily on conversations with peers to make their healthcare choices. Boomers seek information online, mostly in response to a TV ad or printed collateral. 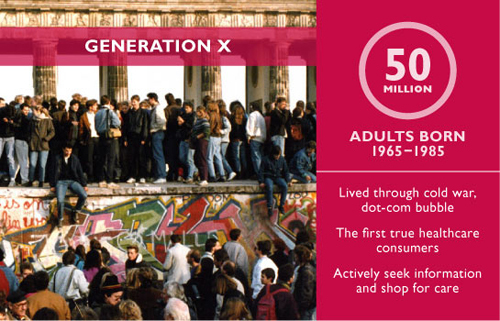 Gen-X is the first true generation of healthcare consumers. They are still in their mid-30s and early 40s and have yet to create a high demand for health services but are curious and actively seek information. Members of Gen-X have a massive attraction to healthcare “brands” and shop for healthcare much like they shop for retail services. Gen-X patients are moderately responsive to hospital tv advertising, but they also have a natural tendency to consult online information sources including rating and review sites. This group has short-term expectations of their healthcare providers and will swap doctors based on their latest experiences. 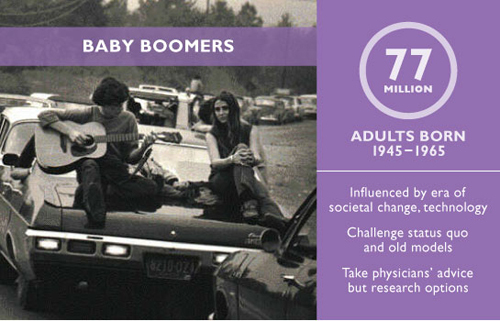 Gen-Y, known as Millennials, make up 75 million adults born since 1982. Still only in their 20s, they have limited use of inpatient or outpatient services and access healthcare mostly through primary care, urgent care and OB/GYN providers. 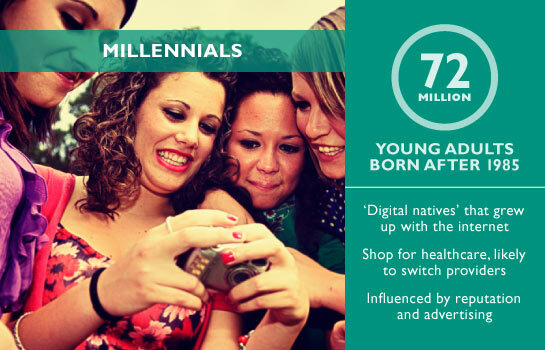 This set of young adults shop for healthcare mega brands! 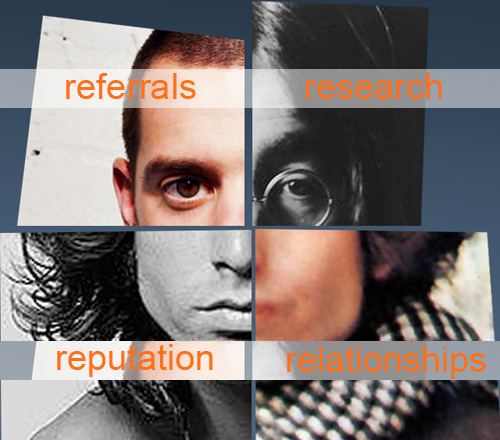 They are influenced by impactful advertising, reputation and patient experiences. Millennials seek health information from multiple different sources, online search, reviews sites and most importantly, their social networks. This young group value personal relationships with their physicians but are likely to switch doctors or hospitals if they have a negative experience. Content and facts from this article were sourced from Smith & Jones. Smith & Jones is an advertising agency who specialize in marketing hospitals and provider networks. Read more on smithandjones.com.